What has the 919 Hybrid in common with the power supply of a village? 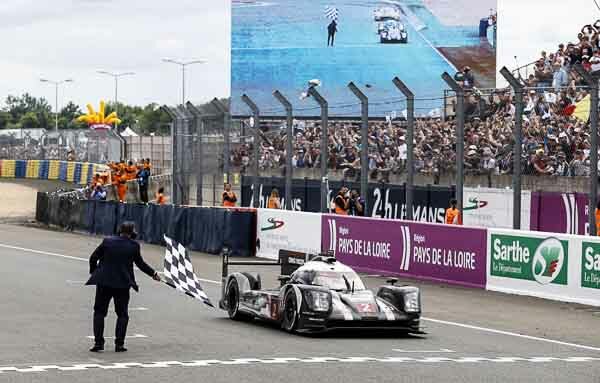 The record of 18 overall wins is the most popular figure about Porsche and Le Mans. Double it, and this is how many further interesting facts you will find here. Discover what the Porsche 919 Hybrid has in common concerning the power supply of a small village, at what time did Mark Webber complete his first-ever lap in an LMP1 car and when Porsche celebrated its first hybrid race car success. The initial roll-out of the first 919 was done by Porsche works driver Timo Bernhard on June 12 in 2013 at the Weissach test track. A little over two years later, he became world endurance champion with the further developed Le Mans prototype. Hollywood stars entered Le Mans with Porsche. Steve McQueen’s attempt made it in to the cinema in 1971, Paul Newman came overall second in 1979 while Patrick Dempsey also climbed the 2015 podium, finishing second in the GTE-AM class. hours is the average time each of the Porsche LMP drivers spend on a massage bed during the 24-hour race. Porsche LMP team members were the small delegation visiting Le Mans in 2013 for research purposes one year before the return to the top category. They witnessed the first win of a works Porsche since 1998 when the 911 RSR won the GT class. people were on board at the end of 2011 when Porsche, under the guidance of Fritz Enzinger, began to prepare for the LMP return. Since 2015 the team’s head count is 260 with 160 of them being engineers. Porsche LMP drivers in three bedrooms: two drivers each share a container behind the pit box to rest and sleep. A shared bathroom is included. Quietness is not an option. megajoules from energy recovery systems per lap in Le Mans is the highest category from the efficiency regulations. Porsche was the first – and for a long time – only manufacturer in that category. The trendsetting challenge behind this: the more electrical power the 919 uses, the less fuel it is allowed to burn. At 10pm on 10 June 2015 Neel Jani set off for the first Le Mans qualifying session. He lapped the circuit in 3:16.887 minutes – which remains a record time. men were the advance guard that began on 23rd May 2017, almost four weeks before the race, to build up the two-floor steel hall behind the Porsche LMP pit box. On May 30, a convoy of eight semi-trailers arrived containing the race cars and the entire equipment. For the test day on June 4, everything has to be in place. gigabyte of data is sent by each 919 to the pits during the 24 hours.